with the latest development version of ffmpeg (ffmpeg-20180611-8c20ea8), it seems that some files are not correctly muxed in .MXF. C:\Encoding\ffmpeg.exe -i "%%~nxF" -pix_fmt yuv422p -vcodec mpeg2video -s 1920:1080 -aspect 16:9 -vf setfield=tff -flags +ildct+ilme -r 25 -b:v 50000k -minrate 50000k -maxrate 50000k -bufsize 36408333 -acodec pcm_s24le -ar 48000 -g 12 -bf 2 -profile:v 0 -level:v 2 -color_range 1 -color_primaries 1 -color_trc 1 -colorspace 1 -f mxf "C:\Encoding\%%~nF encoded.mxf"
The original video is an H.264 profile High, level 5.1, ref1, 3840x2160, progressive 8bit muxed in an .mp4. Nothing weird. The encoded video plays fine on VLC, MPC-HP and PotPlayer, however if I import it into AVID Media Composer or if I link it it displays an error. If I try to transcode the original file in AVID, it works flawlessly, which is weird. This is not the first time I have to deal with this. It's odd. I managed to encode it already, but I decided to report this here 'cause it's odd. Is it ffmpeg? Is it AVID? Who's guilty? Last edited by FranceBB; 12th June 2018 at 18:57. 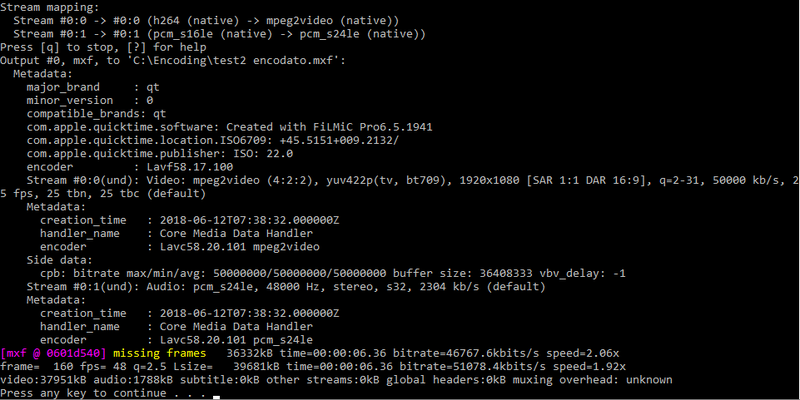 This info about missing frame doesn't look "good" in ffmpeg. Last edited by kolak; 18th April 2019 at 22:48.